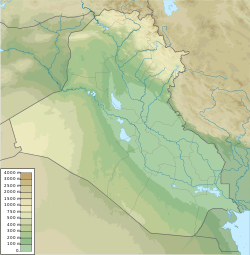 Hillah (Arabic: الحلة‎ al-Ḥillah), also spelled Hilla, is a city in central Iraq on the Hilla branch of the Euphrates River, 100 km (62 mi) south of Baghdad. The population is estimated at 364,700 in 1998. It is the capital of Babylon Province and is located adjacent to the ancient city of Babylon, and close to the ancient cities of Borsippa and Kish. It is situated in a predominantly agricultural region which is extensively irrigated with water provided by the Hilla canal, producing a wide range of crops, fruit and textiles. Its name may be derived from the word "beauty" in Arabic. The river runs exactly in the middle of the town, and it is surrounded by date palm trees and other forms of vegetation enhancing the weather and reducing the harmful effect of dust and the desert winds. It became a major administrative centre during the rule of the Ottoman and British Empires. In the 19th century, the Hilla branch of the Euphrates started to silt up and much agricultural land was lost to drought, but this process was reversed by the construction of the Hindiya Barrage in 1911–1913, which diverted water from the deeper Hindiya branch of the Euphrates into the Hilla canal. It saw heavy fighting in 1920 during an uprising against the British, when 300 men of the Manchester Regiment were apparently defeated in the city. Hillah is located near the ruins of ancient Babylon. It is likely that Babylon was founded in the third millennium BC and rose to prominence over the next thousand years. By the 18th century BC the city was the centre of the empire of Hammurabi. Various empires controlled Babylon over the following centuries. 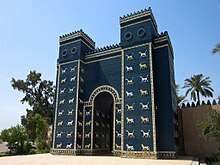 Babylon briefly regained independence during the Neo-Babylonian empire towards the end of the 7th century BC, most notably under the reign of king Nebuchadnezzar II, but came under Persian rule in the 6th century BC. In the 4th century BC, Alexander the Great captured Babylon. Babylon remained a notable Persian province until the 7th century AD, and then fell into decline. The ruins of Babylon have suffered greatly due to looting and destructive policies. Parts of Nebuchadnezzar's palace and some of the old city walls still remain. Saddam Hussein commissioned a non-scientific, much controversial "restoration" of ancient Babylon on part of the site, in the process destroying much of the ancient site all the way to the foundations for the purpose. A modern palace was constructed for him on what was purported to have been Nebuchadnezzar ancient palace. A reconstruction of the Ishtar Gate is displayed in the Pergamon Museum in Berlin. In the 10th century, the town of Al Jami'ayn was founded on the eastern bank of the Euphrates. The location of that town is in modern-day Hillah now. In 1101 AD a new town was founded near Al Jami'ayn. Bricks were taken from Babylon to build houses and so Hillah expanded. During the 18th century, the town became an administrative center in the Ottoman Empire. In the 19th century, the flow in the al-Hillah stream decreased, and that led to worsening conditions for agriculture, which affected them greatly. To solve the problem, al-Hindiya Barrage was built. Hillah was the scene of relatively heavy fighting in the 2003 invasion of Iraq on and around April 1, 2003. Iraqi casualties from the Medina Division of the Republican Guard were unknown but heavy, with several hundred reported to have been killed in fierce fighting with the United States Army's 2-70th Armor. After the battle with the Medina Division the US Army forces moved to Baghdad and the U.S. Marine forces took over responsibilities in Al Hillah. Shortly after the invasion a mass grave site was reported by locals to be in the area around Hillah. Local citizens and members of ORHA worked together to exhume thousands of Iraqis who had been killed by Saddam Hussein's security forces during the uprising against his government in 1991. The 1st Marine Division had established a base at one of Saddam Hussein's palaces about one mile north of Hillah. The 372nd Military Police Company had performed law and order and Iraqi Police training in the city from June 2003 to October 2003 prior to moving on to Abu Ghraib prison. The city was part of the Polish military zone under the occupation of Iraq. After the initial invasion, Hilla was relatively peaceful, but it then became the scene of numerous bomb attacks. In February, 2004, insurgents tried but failed to blow up a camp run by Hungarian troops with truck bombs. February 28, 2005 saw the deadliest single insurgent attack up till then, when a car bomb killed 125 people outside a medical clinic. On May 30, 2005, two suicide bombers killed 31, and wounded 108, Shia police. On September 30, 2005, a car bomb exploded in a vegetable market in Hilla, killing 10 and wounding 30 others. On January 2, 2007, at least 73 people were killed and more than 160 were injured when two suicide bombers blew up themselves at a gathering of Shia militias. On February 1, 2007, a pair of suicide bombers detonated explosives among shoppers at a crowded outdoor market, killing at least 45 people and wounding approximately 150. On March 6, 2007, 114 people were killed and at least 147 people were wounded in two car bomb attacks on a Shia shrine. On May 10, 2010, a series of three to four suicide car bombs at the 'State Company for Textile Industries' in the city killed a total of 45 people and left 140 wounded. On March 6, 2016, a truck bomb hit a military checkpoint in Hillah, killing at least 60 people and wounding more than 70. The Islamic State of Iraq and the Levant (ISIL) claimed responsibility for the bombing. Hillah has a hot desert climate (BWh) in the Köppen–Geiger climate classification system. Most rain falls in the winter. The average annual temperature in Hillah is 23.1 °C (73.6 °F). About 114 mm (4.49 in) of precipitation falls annually. A detailed scientific study at the University of Babylon proved that Babil province is rich with natural untapped oil, gas and minerals of economic and industrial rocks and sediments of rivers and groundwater that can be exploited to intensify studies, geophysical surveys and mining. The Geological Study across the province drew Dr. Amer Khalidi to study the area. And head of Applied Geology Engineering in the Faculty of Sciences and researcher Ahmed Abbas said the lack of investigations that may be almost non-existent for the province of Babylon in this area and reviewing the nature of the mineral wealth of the expected (underlying) in Babil province has been the preparation of this study, which confirmed that Babel is rich with natural and that can be invested now it did not specify a lot of geological surveys and investigations mineral underwent her areas of Iraq for eight decades, including the province of Babylon natural resources potential and determine the nature and distribution Babil province and determine its reserves In this regard, the study to oil and gas as are among the most important natural resources discovered in Iraq, and Iraq has become rich in this wealth and classifies it as a second (and some of them thought first) the existence of the largest oil reserves in the world. Babil province has ten hospitals with 1,200 beds. At the beginning of 2005, the local health department announced some plans to build two hospitals with 50 beds each near Al-Khifil and Al-Shomaly. Major hospitals in Hillah, will also receive major renovations. Staff master plan is to raise the level of training of personnel in the field of nursing and re-construction of new health centers across the province. Hillah contains four major government hospitals and they are: Hillah General Teaching Hospital, Babylon Hospital for Women and Children, Mirjan Teaching Hospital, and Al Noor Hospital for Children. Since 2008, Hillah has hosted an annual medical conference under the slogan "Babylon .. cultural capital of Iraq .. the future of medicine in scientific research". The conference offers a number of scientific presentations that address the medical health and education in the country and projects to support health and medical research in the future. There is also an exhibition of modern medical devices and electric vehicles for people with disabilities, in addition to medicines and treatments. Hillah has a rich cultural history and widely published in history books, literature, geography, and biographies. The single most famous medieval Shia theologian, Allamah Jamāl ad-Dīn Hasan al-Hilli is a native son. It was chosen as the cultural capital of Iraq in 2008 because of its large cultural gatherings and art galleries, as well as the many talents in all fields of culture and art, particularly poetry, writing, music and vocals. And many well known Iraqi writers have written about it, including: Mr. Abdul-Razzaq al-Husseini, Abd al-Qadir al-Zahawi, Mohammad Mehdi Aljawahiri, Rusafi, Sahtia AlHasri, Dr. Fadel Aljamali, Thi Alnun Ayoub, Dr Ali Jawad Tahir, and Ahmad al-Safi al-Najafi. Many writers, poets, and artists have also come from Hillah, including: Sharif Alrhdi, Dheyaa Hamio, Saifuddin Al-Hilly, Mohammed Mahdi Albasir, Ali Jawad Tahir, archaeologist Ahmed Sosa, Taha Baqer, and Ahmed Saeed. The Ottomans established modern schools, including the school Al-Rashidiya where material was taught in Turkish. The first elementary school in Hillah was Madrasat Al-Sharqia, which was founded in 1918 with one class and twenty students. It was located in the top floor of the Grand Mosque and the first director of it was Mr. Abdul Mahdi al-Hilali. Later the school moved to a building on the Shatt al-Hilla with four classes, but this school was not stable because the majority of students leave these schools to study at the seminary. The first secondary school in Hillah, established in 1927, was Al-Hillah Secondary School. Another school was Moderiat Alm'arif, founded in year 1931. University education in Hillah started with the founding of the Institute of Management in 1976 and the foundation of the Department of Technology and Management Branch Stores. In 1980 it was called the Technical Institute; today it is called the Technical Institute in Babylon and includes the following fields: scientific (civil and space and electrical and electronic devices, computers and mechanics, machinery and equipment), administrative (accounting, management, and computer systems), and medical (community health and nursing). In 1959 the Technical Institute established a project Musayyib that included these disciplines: technological (Irrigation and mechanics, machinery and equipment), administrative (accounting, warehouse management), and agricultural (plant production, soil and land reclamation, machinery and agricultural equipment, and production of life). Starting in 1991, the University of Babylon offers education in fine arts, law, engineering, science, education, medicine, management, economy, literature, agriculture, science for girls dentistry, veterinary medicine, and nursing. The university includes several scientific centers: Center for Studies Babylonian Center, documents and studies Hillah, electronic calculators, Teaching Methods Development Center, and Continuing Education Center. The province of Babylon contains five universities: Babylon University, Alqasim Green University (introduced in 2012 in Al-Qasim), Al-Nahrain University, Almostaqbal University College, and Hillah University College. Located just 5 km north of the city of Hillah, Babylon was a marveled city of the ancient world, especially under the rule of king Nebuchadnezzar (605-562 BC). It was the capital of the Neo-Babylonian Empire and its walls and hanging gardens were considered one of the seven wonders of the world. Kish is located 13 kilometers from city of Hillah and 6 km east of the ancient city of Babylon. The ruins including the ziggurat "Inner Cdermh", a ziggurat structure of "Baba deer", god of war. Alberes is situated south of Hillah, approximately 15 miles away. It has a tower found between Hillah and Al-Khifil. Its current name is a distortion of the name Old Babylonian "بورسيا" (which is now a newspaper) and its Sumerian meaning is "sword of the sea", because it was located on the Ghadeer edge along the banks of the Sea of Najaf. ^ Money, Robert I. (1917). "The Hindiya Barrage, Mesopotamia". The Geographical Journal. 50 (3): 217–222. doi:10.2307/1779909. JSTOR 1779909. ^ "Bombings rock Shiite city". Associated Press, February 2, 2007. ^ Abbas al-Ani (10 May 2010). "102 killed in Iraq's bloodiest day this year". Agence France-Presse. Retrieved 1 November 2010. ^ "Islamic State truck bomb kills at least 60 people south of Baghdad". Reuters. 6 March 2016. Wikivoyage has a travel guide for Hillah. "Hillah" . New International Encyclopedia. 1905. Peters, John Punnett (1911). "Hillah" . Encyclopædia Britannica (11th ed.). "Hillah" . Collier's New Encyclopedia. 1921.